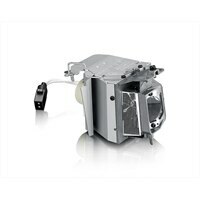 Dell Replacement Bulb - Projector lamp 5000 hour(s) (economic mode) - for Dell 1850You never know when your projector's lamp might fail, so it's smart to carry a back-up on business trips or keep a spare one at the presentation facility. This replacement lamp from Dell™ is a life-saver, if your projector's bulb burns out. This durable lamp will give you approximately 5000 hours (Eco-mode) of excellent, crisp and clear brightness. This product has been tested and validated on Dell™ systems. It is supported by Dell Technical Support when used with a Dell projector. You never know when your projector's lamp might fail, so it's smart to carry a back-up on business trips or keep a spare one at the presentation facility. This replacement lamp from Dell™ is a life-saver, if your projector's bulb burns out. This durable lamp will give you approximately 5000 hours (Eco-mode) of excellent, crisp and clear brightness. This product has been tested and validated on Dell™ systems. It is supported by Dell Technical Support when used with a Dell projector.